The ocean is full of strange partnerships between creatures where each side benefits in some way from living with or near the other. These symbiotic relationships help ensure the continued survival of some species and improve the health of others. The Yellow tangs are bright yellow fish that belong to the family called Acanthuridae. The yellow tangs and the Green sea turtle (endangered) share a mutually beneficial relationship. The tangs eat algae and parasites off the turtle's skin, cleaning the shell. 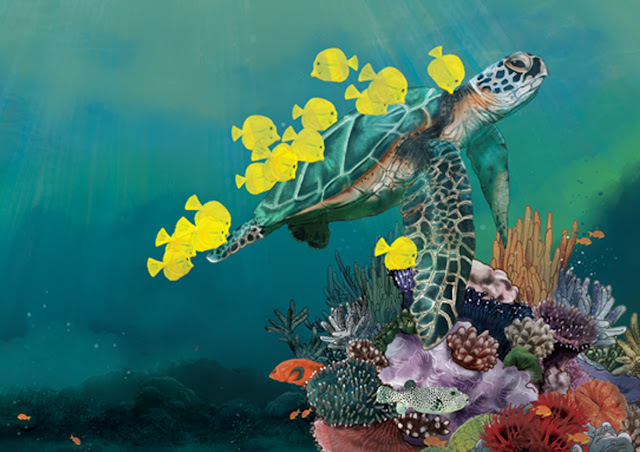 While the turtle gets a free spa, the tangs are provided with a rich meal in one spot, saving them energy and protecting them from the risk of stumbling across enemies while grazing the reef. Representation focus — on the marine ecosystem of Angria Bank Coral Reef, Maharashtra, India.